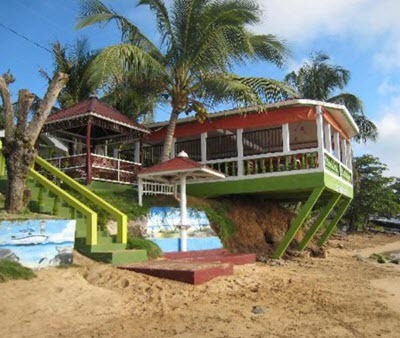 Here are a few examples of restaurants and bars located on Little Corn Island. If you are looking for a place do go dancing, Happy Hut and Aguilas Bar are two popular options on Saturday nights. Both places tend to attract a mix of Nicaraguans, resident expats and tourists. Located on the beach on the island’s western side. Open for breakfasts, lunch and dinner. Closed on Mondays. 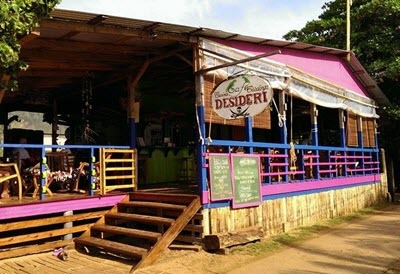 An excellent combination of Nicaraguan and Italian ingredients goes into the food at this café. Examples of popular choices: Italian pasta dishes, lobster termidor, burritos, salads, sandwiches. The drink menu includes fresh juices, brewed coffee, wine and cocktails. From the port, head south and follow the sings to Casa Iguana. A favorite choice is the three-course meal with freshly caught fish, available every night. Located south of the port. El Resto del Bosque is located a bit back from the main drag, not far from the entrance to Casa Iguana, and to the right of Rosa’s. This is a small family-run restaurant serving up sturdy portions of fresh fish and seafood. Desserts also available. El Resto del Bosque is a great budget option, especially considering the size of each meal. Located north of the port. Last time we checked, this place didn’t have a fixed schedule, and some of the dishes need to be ordered in advance. Renowned for their chicken and pork meals. One of the owners is from Cuba, hence the name. Located south of the dock, at Hotel Los Delfines and Dolphin Dive. If you are looking for great lobster dishes, this is a great place to go. Prices in the upper range, but still attracts a big crowd in the evenings. Located in the forest, near the entrance to Casa Iguana. A brightly colored wooden shack on the beach, near the docking spot for the pangas. Located south of the dock, between the dive shops Dolphine Dive and Dive Little Corn. Opens between 9 and 10 in the morning and stays open until midnight. Closed on Sundays. Examples of popular menu choices: grilled chicken sandwiches, fish taco, home-made mac & cheese, fish & chips, chevice, philly cheese steaks, house-made ice cream, house-baked brownies. Good selection of vegetarian / plant based food. Freshly brewed gourmet Nicaraguan coffee. Fruit juice from tropical fruits. Nice selection of imported and Nicaraguan beers, including craft beers. Famous for arranging bonfire parties once or twice a week. 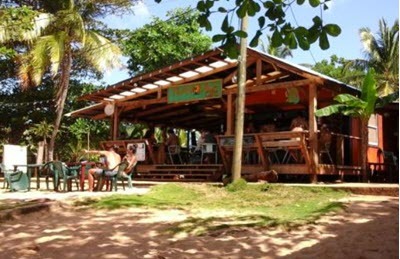 Located on Cocal beach on the island’s eastern side, roughly half a kilometer north of Casa Iguana. Open every day of the week. Famous for having really good coffee, for being popular among both meat eaters and vegetarians, and for serving up Big Jeff’s Mudholes and Bloody Caesars. The lunch menu includes dishes such as coconut shrimp tacos, pork sliders and BBQ bacon cheeseburger. Kids lunch menu available. The dinner options are 4 plate and include starter + soup / salad + main course + desert. Kids dinner menu available.